Online copy of table data to target RDBMS: This (default) will copy the data to the target RDBMS. Create a batch file to copy the data at another time: The data may also be dumped to a file that can be executed at a later time, or be used as a backup. This script uses a MySQL connection to transfer the data. 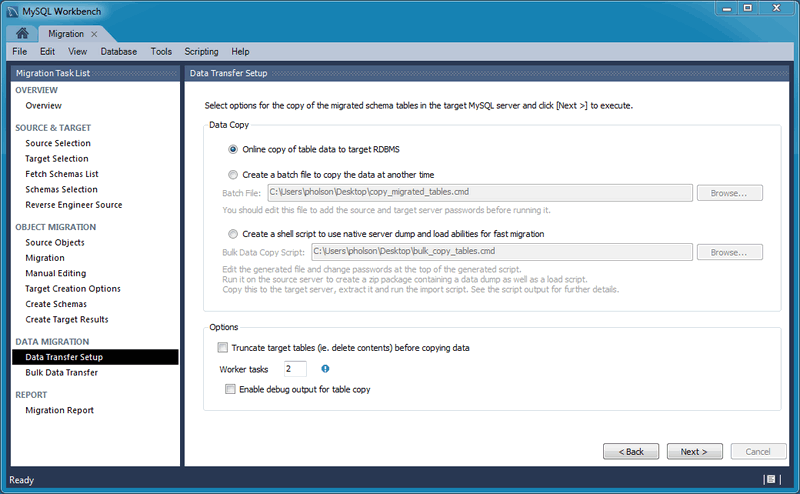 Create a shell script to use native server dump and load abilities for fast migration: Unlike the simple batch file that performs a live online copy, this generates a script to be executed on the source host to then generate a Zip file containing all of the data and information needed to migrate the data locally on the target host. Copy and extract the generated Zip file on the target host and then execute the import script (on the target host) to import the data into MySQL using a LOAD DATA call. This faster method avoids the need to traffic all data through MySQL Workbench, or to have a permanent network connection between the MySQL servers. This option was added in MySQL Workbench 6.3.0. Truncate target tables before copying data: In case the target database already exists, this will delete said data. Worker tasks: The default value is 2. This is the number of tasks (database connections) used while copying the data. Enable debug output for table copy: Shows debugging information.